Despite Northern Ireland and Ireland belong to the same Island there are some interesting perception differences when we talk about destination. We have observed in a new research how their main touristic attractions looks in terms of #DestinationPersonality. The main destinations that we’ve considered are Giant’s Causeway and Belfast for Northern Ireland, Cliffs of Moher and Dublin for Ireland. In this way, we balanced the naturalistic and the urban aspect of the two countries. We started analysing the travel motivations and we noticed some differences in the tourists’ response; we asked them to rate the four locations according to four factors: “Culture”, “Pleasure”, “Relaxation”, “Sport”. 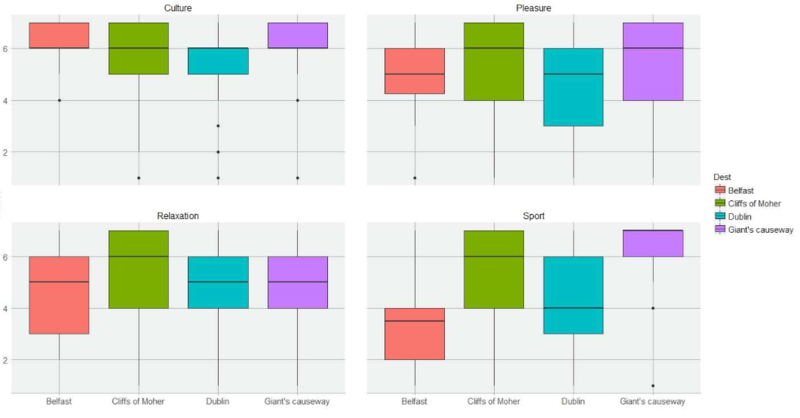 Belfast and Giant’s Causeway have the highest values concerning the cultural factor.Both the Cliffs and Giant’s Causeway present high values for the pleasure factor, but Giant’s Causeway highlight the highest value in terms of sport factor while the Cliffs show the highest value for relaxation factor. In terms of self-identification in the Giant ’s Causeway represent the strongest value while Belfast the lowest one. On the other hand cliffs and Dublin obtained the same score. 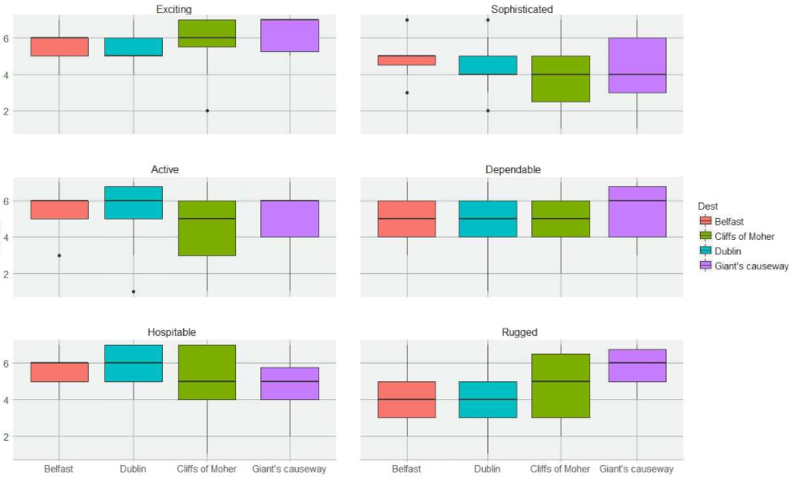 Regarding the #DestinationPersonality Giant’s Causeway, with respect to Cliffs of Moher, is perceived as more sophisticated and dependable but at the same time also as more rugged and less hospitable.Comparing the two cities Belfast is perceived as less active and inhospitable but also more slightly and more sophisticated. With this preliminary research, our aim was to test the waters in order to understand if there will be possible a further and deeper research. Despite the small size of the two groups, we obtain quite promising results that make us want to analyse deeper the differentiations, in terms of #DestinationPersonality, between this two courtiers, so similar, but also so different. So..